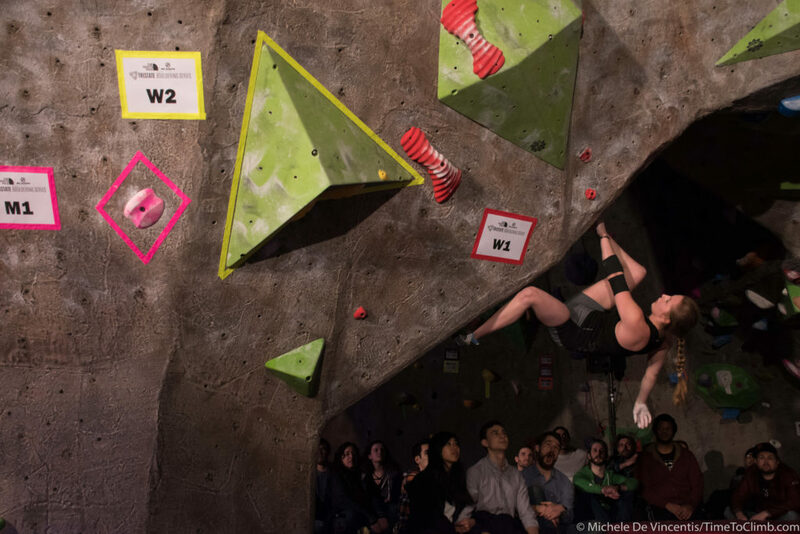 How many times has a climbing partner shouted these exact words while you were on the wall? Your body’s gone rigid in anticipation of the next move. An unconscious tension increases the pump in your arms and you quickly fatigue. The combination of extreme concentration and stress halts one of our most natural processes. Active breathing while climbing is responsible for many sends, especially when working through a crux or pushing a grade beyond our limit. The act of controlling one’s breathing is integral to yet another activity. 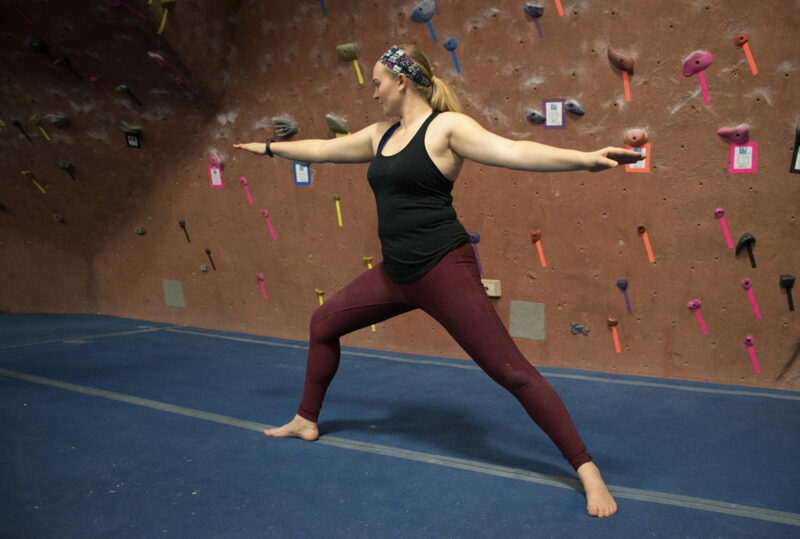 In yoga, the practice is known as pranayama or “an extension of the prāṇa (breath or life force)’ or ‘breath control’.” It’s no surprise that yoga and rock climbing share foundational tenants – from breathing to body awareness, focus & visualization, to meditation. Conscious breathing takes effort. It’s filling the belly, allowing it to fully expand and exhaling in tandem with a specific movement. In rock climbing, the exhale occurs during a particularly difficult move. In yoga, this translates to a forward fold or when deepening a pose. Both instances utilize the power of controlling one’s breath to accomplish a specific task. At the Tristate Bouldering Series “Feats of Strength” competition, Mikayla Tougas takes a moment to shake out and breathe before a big transition. “Ocean Breath” or Ujjayi Pranayama is actively used throughout one’s entire yoga practice. A steady and deep inhale through the nose quiets the mind. The exhale (through the mouth or nose) emits a sort of wheeze or ocean sound by actively forcing the breath from the stomach. Think of slightly contracting your throat as you would while whispering or how you would breath when fogging up a window. 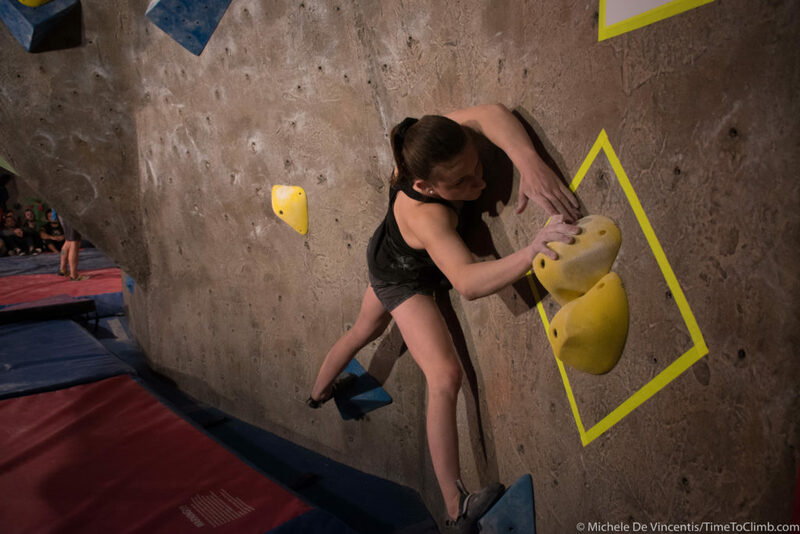 This exercise links the body and mind to the present moment, releases pent-up emotion, and calms the nervous system, allowing climbers to work through fear during difficult sequences. Cultivating balance while climbing is closely related to honing in on perfect technique. How does your body operate best? What feels effortless and right? Alignment, proper placement of hands and feet, balance, and sinking into that center of gravity all play a vital role in being able to stick moves. Climbers are consistently reminded to tuck their hips, to keep their center of gravity low and close to the wall. It’s imperative to combine both alignment and tension to take stress off the fingers, to save energy, and climb smart. Body awareness is an imperative tenant of yoga. During practice, participants are asked to shift their awareness in order to build muscle memory in poses. For instance, “Warrior Two,” a pose that focuses on proper weight distribution between both feet, squared hips, relaxed shoulders, and extended arms, asks that the yogi practice mindfulness – all while keeping her face relaxed and her breathing steady and deep. This act of total awareness allows yogis to receive the most benefit from poses. 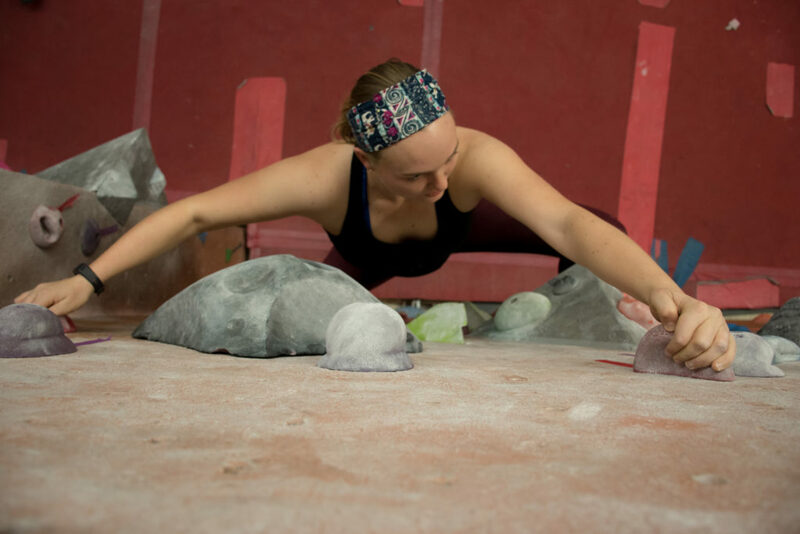 Similarly, tuning in to proper form while climbing builds a body-position library. Muscle memory is called muscle memory for a reason. When a move is performed regularly, the body acclimates to positioning and strength is cultivated. That’s why it’s imperative that climbers diversify the type of routes they climb. The physical experience allows them to develop true muscle memory. Previously practiced moves are executed fluidly and with confidence. The result is less stress on the body and the motion being performed with greater ease. tucked hips which allows her to sink into a low center of gravity. As trite and cliché as it may sound, believing is the first step to completing tough moves and sending a project. But what about all that white noise, the fear, and doubt that creeps into our minds while hesitating between moves? A strong head game is just as important as breathing and technique. Keeping a cool demeanor while in at the crux of a sequence is by no means easy. Here’s where the mentality of “the only way out is through,” comes into play. 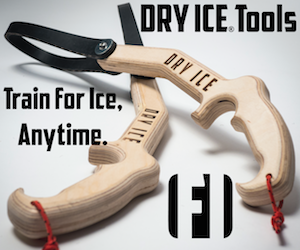 Working through stressful situations and leaning into them, is imperative to building tolerance for moments when bailing isn’t an option – like in ice and mixed climbing. Find comfort in discomfort. Yoga teaches the practice of non-duality. Not every pose is easy. Few of them are. In fact, more often than not, the body is constantly fidgeting. The mind is telling us to break the stance, saying – this hurts (even when it doesn’t) and I can’t do this. The unfamiliar has a way of scaring us to inaction, but if we try, if we breathe, self-soothe, and tell ourselves that we are okay – we are safe – we’ll be surprised at what can be accomplished. Crow Pose, for instance, is initially terrifying as it forces the yogi to extend forward and balance. Those attempting this pose are encouraged to get used to the feeling of lifting off by raising one foot from the floor – and then the other – until the full pose is attained. 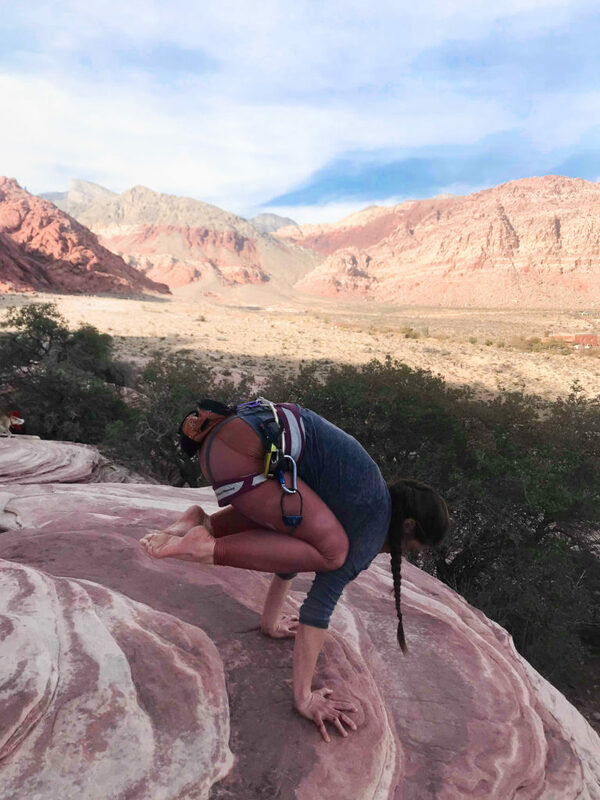 Alison of Alison Bernasco Yoga (left) and JP (right) strike Crow pose in two completely different environments – outdoors and in the climbing gym. Embracing discomfort and fear while climbing is the first step to conquering these feelings. The only way to do that is to put oneself in that particular headspace time and time again, and to combine muscle memory with intense focus. Visualize the move, earnestly commit, and execute. When pushing limits it’s important to check in with oneself often – how does your body feel? How are you fairing emotionally and mentally? Answering the above questions openly and honestly will do wonders for your athletic performance. There will be strong and weak days, motivated and lazy days. It’s impossible to perform optimally one hundred percent of the time. The key is to step back and look at the whole picture – are you achieving your goals and enjoying yourself? Yoga asks its practitioners to meet themselves on the mat – to push, but not to pain, to challenge mindfully and with purpose. Climbing is the same. It’s easy to get wrapped up in the pursuit of sending a project, but meditation encourages us to separate from the ego and experience the situation without bias. This is a tried and true birds-eye view. 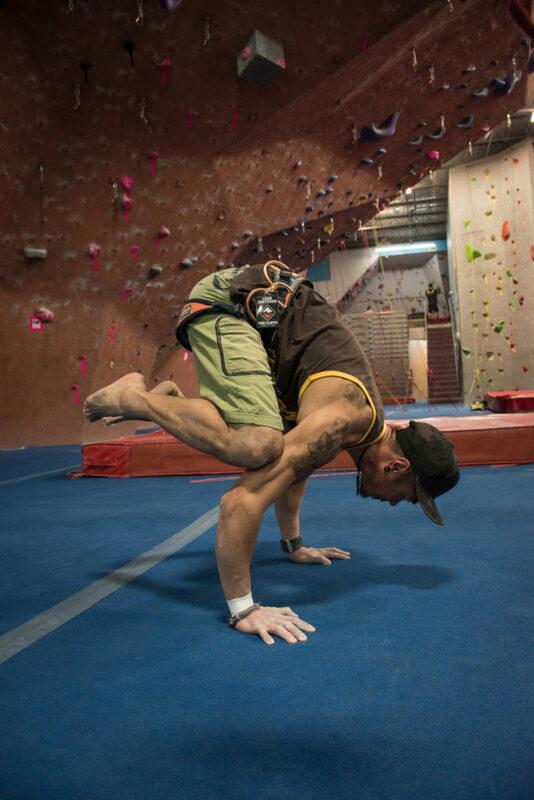 Climbers and yogis alike are sure to benefit from a bit cross training. The skills learned from both practices are equally transferrable and will undeniably push their participants’ abilities to the next level.